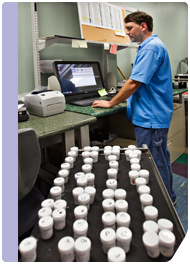 Cytologic evaluation is available for all brushings, aspirates, fluids or sputum specimens. Please contact our client service department to ensure that you have the appropriate collection kits and shipping instructions for cytology specimens. If you have additional genetic testing needs, please contact our Client Service Department for additional support. D-PATH dermatopathologists have access to an in-house team of experts in hematopathology. This team of board-certified experts has the latest technology to provide expert consultation in these critical patient cases. D-PATH’s core business is centered on routine histologic diagnosis of tissue biopsies. We are equipped with the latest technology and processes including a comprehensive menu of special stains to address all dermatologic conditions. The accurate diagnosis of bullous and other immune diseases of the skin requires evaluation by immunofluorescence. If you require IF evaluation, please contact our client service team so they can ensure you have the appropriate collection kits. A comprehensive menu of immunohistochemical (IHC) markers and special stains are offered. These include such important stains as CD34, Cytokeratin, Facor XIIIa and the Pan-melanocyte cocktail. Identifies 17 pathogenic bacteria and fungal species associated with wound infections and detects of up to 36 genes that confer antibiotic resistance.